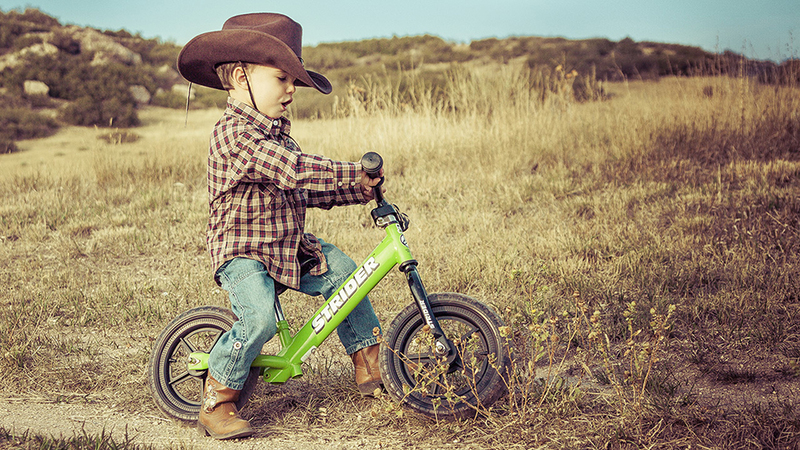 At Strider®, we love riding bikes, and we love inspiring kids to ride. Our mission is to build lightweight, efficient, all-terrain bikes that develop two-wheeled balance, coordination, and confidence in children. Strider builds quality products focused on proper fit and function for the rider. Strider believes in the importance of a strong brand identity. Strider supports distribution channels committed to educating customers. Strider serves customers with an empathetic, just, and generous heart. Strider values a family-friendly workplace where the workdays fly by and the work itself feels like a grand adventure. Strider values passionate people who believe their efforts will change the world for the better. Learn To Ride Rethink the Definition of Riding What defines riding? Does pedaling define riding? Downhill mountain bikers don’t pedal, road bike riders descending a highway don’t pedal, BMX riders in a halfpipe don’t pedal, and motorcyclists don’t pedal. They are all riding. So what do they all have in common? The ability to balance on two wheels, and lean through turns regardless of what put them in motion. For children, walking and running are the natural means of propulsion. The simplicity of Strider bikes allows children to concentrate on the fundamental skills of balancing, leaning, and steering while propelling the bike in a natural way. Advantages of Riding a STRIDER Research shows that learning balance and coordination with exercise jump-starts a child’s growth and development during the important formative years of early childhood. Adjust the bike to fit the child! Saddle height is the most critical adjustment, followed by handlebar height. Set the saddle height so the child’s feet are flat on the ground and both knees have a slight bend in them when seated. A good starting point is 1” less than the child’s inseam. Set the handlebar height with respect to the saddle. If the saddle is at its lowest setting, set the handlebar also to its lowest setting, etc. Kids grow quickly. Be sure to adjust the bike every couple months. Be a Cheerleader, Not a Coach. Children will instinctively throw a leg over the Strider and want to go. Encourage them to do this and give them praise for any amount of time they spend on the Strider. Let the Child Set the Pace. Some kids jump on the bike and go, go, go. Other kids are more cautious; some may not even sit on the seat at first. This is okay! Their security is in their feet at this point, and we want them to feel secure. As they get comfortable walking around with the bike between their legs and working the handlebar, they will start to ‘trust’ the bike and the saddle. Let them learn at their own pace… they’ll be striding along with feet up on the footrests before you know it! Support the child – NOT the bike! We instinctively want to help the child by holding onto the bike to keep it from tipping; don’t do this. The child must be allowed to feel the bike tip sideways to be able to learn how to keep it from tipping. If the adult supports the bike when it tips to one side, the child mistakenly thinks that the most stable place for the bike is tipped over to the side. This is the fallacy of “training” wheels. If the child needs assurance, simply walk next to them and hang onto the back of their shirt so that they can feel safe. First, don’t rush pedaling. Striding and practicing balance is fun! Even if your child appears to be striding like a pro, moving to a pedal bike too soon can derail progress and discourage your child. The weight of a pedal bike is significantly more (sometimes two to three times the weight of a STRIDER), and handling that extra weight can be very frustrating to a child. Let them practice, play, and perfect their balance and bike handling skills while having fun on their Strider bike. Be confident that all time spent on a balance bike will only make them more proficient on a pedal bike the day they decide to transition. Second, never ever use training wheels! If you feel your child is ready to pedal, we recommend finding the simplest, lightest bike possible. Avoid “bells and whistles” as they all add weight and distraction. We also recommend that pedal bikes have a freewheel hub and a hand brake. Do not buy a bike for your child to “grow into”. A bike that is too large won’t fit properly, will be too heavy, will be unsafe, and will ultimately discourage your child. With the seat at its lowest setting your child should be able to touch the ground flat footed. Remember, training wheels are NOT a solution to a bike this is too large. Third, keep it fun! Putting kids on a pedal bike too soon will limit where they can go. 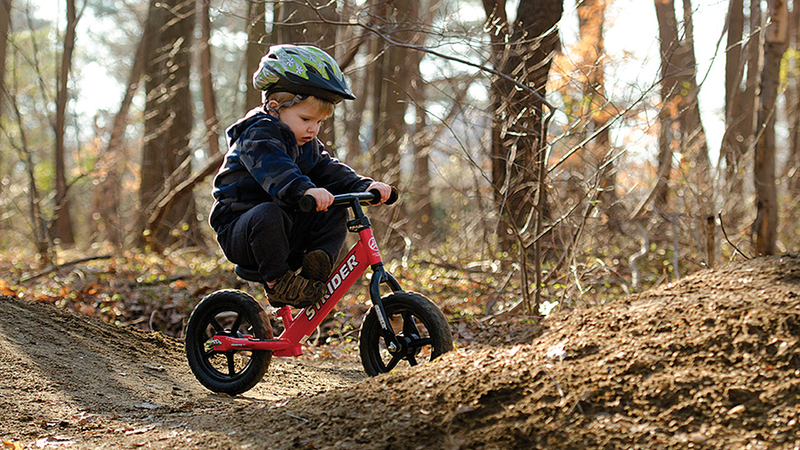 It is much harder to ride a pedal bike on grass, dirt, or over obstacles than it is on a STRIDER. Keep in mind how important fun and adventure are to a kid. The lightweight simple STRIDER has a “fun factor” simply not available on a heavy pedal bike at a young age. We recommend having both the Strider bike and the pedal bike available to the child so they can choose which they prefer on a given day. We recommend this overlap for at least a year. At some point of the child’s choosing, as they get taller, stronger, more skilled, and more confident, they will complete their transition to a pedal bike.